For many hand tool woodworkers, analog and imperial is the only way to go. Sometimes the modern world imposes itself on me and I have to bite the bullet and go digital and even occasionally metric. 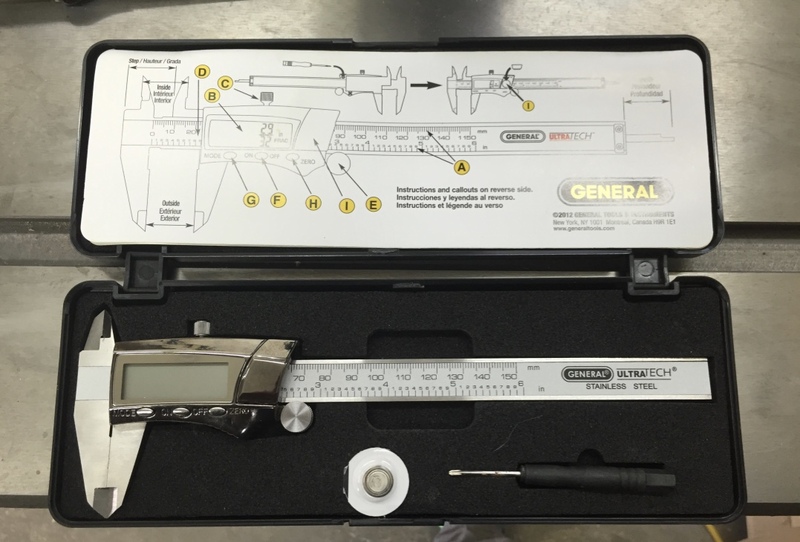 General Digital Calipers in nice fitted case with extra battery and screwdriver. When I ran some muntin stock for a window sash the portion of the profile it was slightly narrower than my mortising chisels and hollow chisel mortising bit. I triple checked the setup of the knives and made sure they were aligned. I then took the chisel to the knife and it was slightly wider than the template. The CAD drawing of the knife matched what I expected the knife to look like. 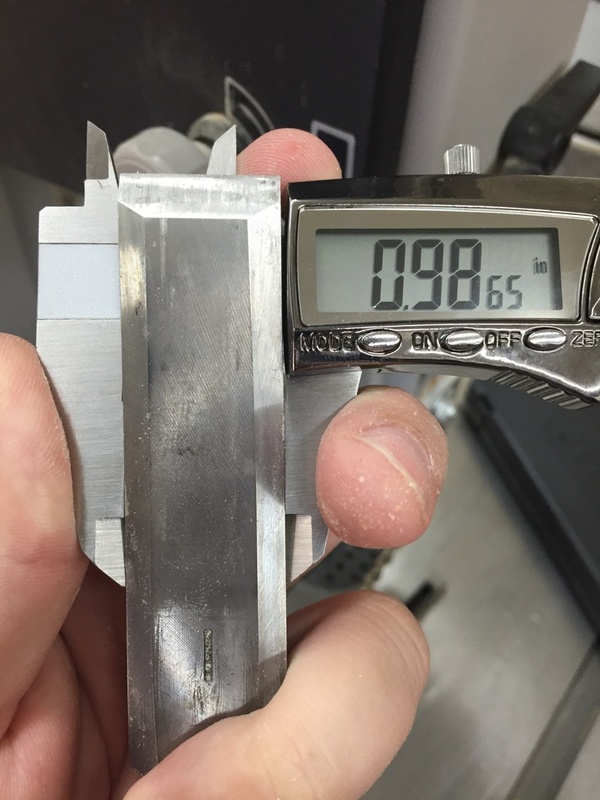 When talking to the knife manufacturer he asked that I double check the size of my chisels and I broke out the old, low resolution (1/32″), manual calipers I had and described what I was reading. That is where our two different worlds met. My trusty old General Tools Vernier caliper which worked great for comparing say two tenons — as I don’t have to read the value so much as compare — sort of like using a pair of wooden ‘pants’ on a timber tenon do not give the digital readings he was expecting. Terms like ‘a very tiny bit over 3/8″ ‘ don’t work in this context. TIP: When taking measurements, especially those wherein you want to compare say two tenons, make sure you secure the lock screw — this way the jaws do not move. I wound up having to send in my chisels for him to look at and adjust the knife, which I am grateful he did, but I did not want to repeat this experience. Right after the above I had the opportunity to get a digital caliper set from General Tools. I’ve toyed with the idea of getting a real nice dial caliper like a Starrett but $185-$700 was out of my price range (Though I do use a Starrett Dial Indicator for setting up my stationary tools and love it) or high end digital caliper like the Mitutoyo ($150-$500+ depending on model), but for how often I’d use it I could not justify the price. Enter the General Tools Model 147 Stainless Steel Digital Caliper. 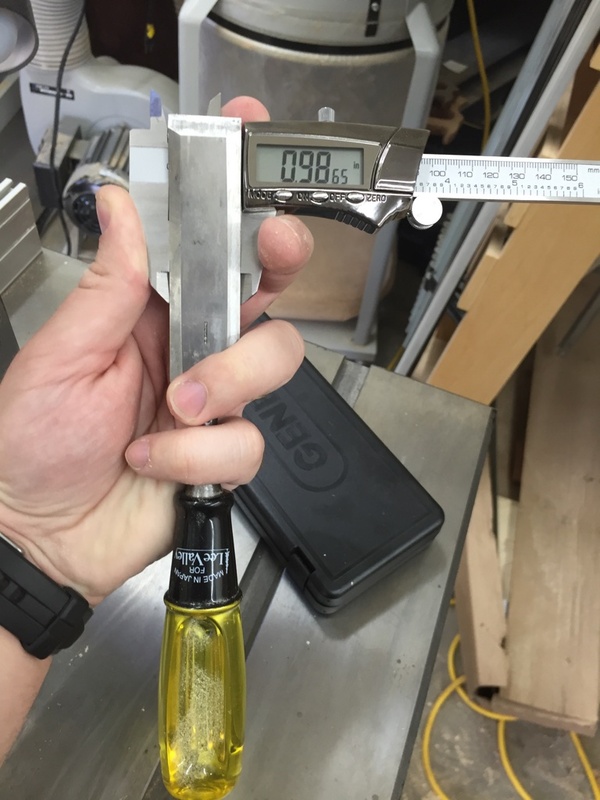 The tool sells for about $25 on Amazon.com and claims and accuracy of ±0.001 in./0.02mm and a resolution of 1/64 in./0.0005 in./0.01mm. I read all the reviews for this model and similarly priced calipers and wanted to see for myself how good it was or was not. Top concerns I saw in the reviews for this sort of tool — questions around repeatability of measurements, battery life and accuracy. 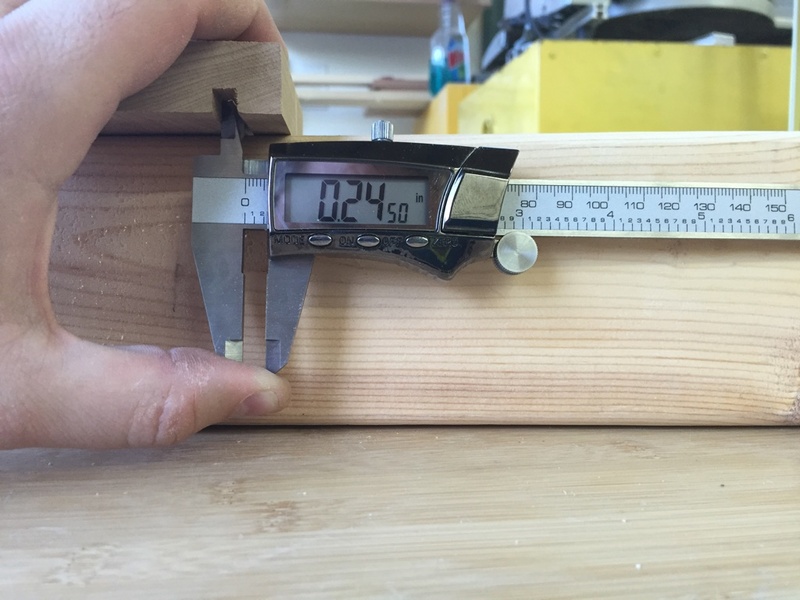 As a woodworker my measuring tools usually are only graduated down to 1/128th of an inch at most, anything beyond that is tested by hand, eye and reference straightedge. Anything beyond that I defer to my machinist friends who like to get OCD about ambient temperatures and other fine details of super high resolution measuring. The caliper comes in a nice little plastic form fit case, along with a tiny screwdriver for the battery compartment along with a spare battery. (See first photo in post). The caliper seems to be mostly stainless steel with what looks like metallic coated plastic around the display. Overall to tool has a nice weight and finish quality and seems to be machined better than I expected. My only real nitpick is the thumbscrew has a tiny bit of play left and right, not in the direction it drives, so it doesn’t affect performance, but is something I noticed on close inspection. After taking a measurement I took a few other measurements, defined a new zero location, either arbitrary or using a reference like a machinists 1-2-3 block and then re-zeroed out the caliper and re-tested the chisels. I was able to get consistent readings each time. Using the upper jaws to measure inside. I also took some inside measurements (as shown above) and used the depth gauge rod (not shown) and had similarly consistent results. The fractional mode only displays down to 1/64″ and if you want higher resolution output on the screen you’ll need to use the imperial decimal mode or the metric (mm) mode. I like the ability to switch modes as it takes out some of the human error in converting from fractions to decimals or to metric measurements. Tip: When taking measurements such as the chisel above make sure the jaws are firmly up against the item being measured and parallel — don’t be lazy using your finger on the thumb screw (used to open or close the jaws). Others noted battery life issues, but my inner-engineering OCD likes to shut of the caliper as soon as I am done using it, but a few times I left it on to make sure that it eventually shut off and it seemed to work fine for me. The form fitted case has an instruction sheet in it when you get it and I wonder if for some folks if they didn’t seat the caliper properly in the case or put something on it so heavy that the closed case gets a little crushed/deformed it might press the buttons and prematurely drain the battery. I’ll keep an eye on battery longevity and add comments if things change, but so far so good on that front and I like knowing I have a spare ready to go in the case. For this price range do I expect the tool to replace the high end premium line — no. But do I need a premium high end dial or digital caliper in my woodworking shop, also a no. This tool is a nice step up from my old caliper, offers and accuracy range above what I expect to work at and seems to be a real good value for the woodworker in need of more accurate measurements and a solid user tool. P.S. If you are interested in the same model, you can find it here on Amazon. I do not get anything from sharing that link. If you have this tool or get one for yourself, let me know what you think of it in the comments below. I’ve had terrible luck with digital calipers and finally just gave up on them and got a used Mitutoyo dial caliper. Glad to hear you found one that works well. We’ll see how well this unit does over the long term. 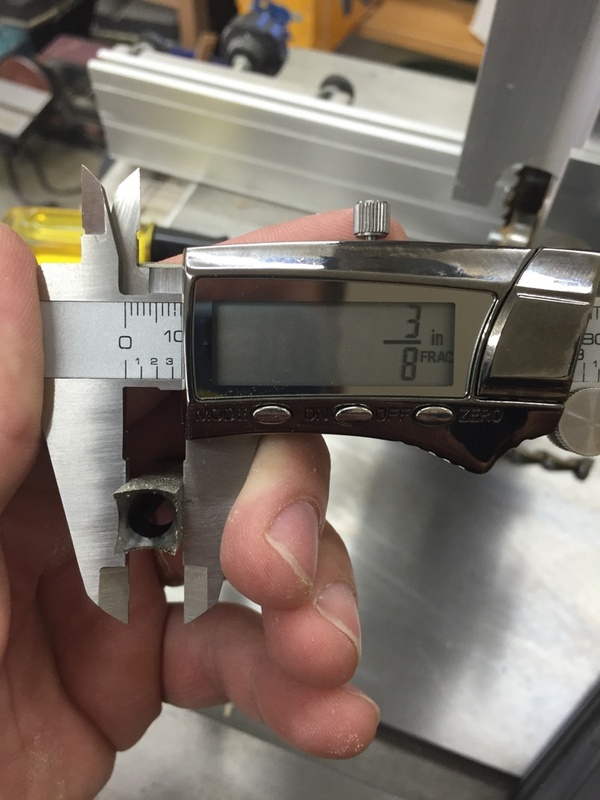 Mitutoyo, digital or dial, are indeed excellent calipers. I have had the same unit for about six years. Still on the original battery. It has been a great tool to have around the shop. I am very particular about my timber framing chisel widths, and this is way better than using a steel rule. Regarding .0001″, temps, etc., a machinest friend of mine told me tenths were for cowboys and Indians.